On Saturday West Suffolk Swimming Club travelled to the City of Peterborough to compete in round one of the National Arena Swimming League. After last year’s great success and subsequent promotion to the Premiere Division, West Suffolk were all set for even tougher competition this time around. Also competing at this venue were teams from South Lincs, Chesterfield, Bramcote, St Ives and the host club Peterborough – the East Midland League winners for the past 6 years. After the first couple of events the level of competition within the Premiere Division was clear to see, however West Suffolk did a great job of stepping up to the mark and showed a brilliant early display of their strength and self confidence, with some tough racing which enabled them to pick up a lot of points from the first 8 relay events. The next 32 events were all individual battles which not only saw points won or lost by fractions of a second. The West Suffolk swimmers put in some fantastic swims, with many points gained by courageous and determined finishes. Peterborough’s strength was apparent but not overwhelming and although they seemed to have control of the top spot by the half way point, the tightness of the competition was highlighted by the fact that there was only 3 points separating 2nd from 4th at this stage. 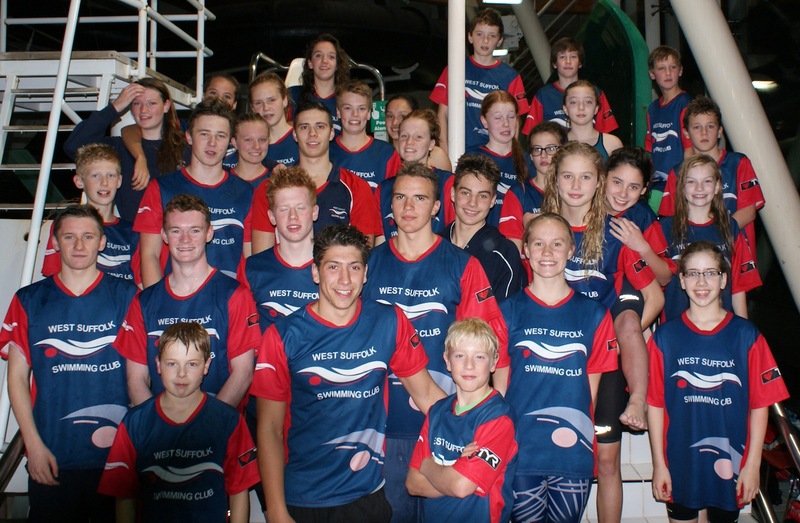 West Suffolk remained consistent and strong with some outstanding individual swims. Ciaran Riches outclassed the field in both of his individual events to gain 1st place finishes and maximum points. The slightly more senior and experienced Lana Mo had a very busy night with 7 races in total including relays and individual events in which she won 1st place in the 15 & under 100m Breaststroke, accompanied by a hand full of 2nd places and she failed to finish outside the Top 3 in any of the races she was involved in. West Suffolk’s most senior swimmer on the night Danny Proffitt also did a great job securing 1st place finishes and therefore maximum points in all 3 of his Individual swims. West Suffolk pulled away during the second half of the gala leaving Chesterfield behind and with another flurry of great relays to conclude the gala, West Suffolk finally secured a 2nd place overall finish by 25 points. This result puts them in a good position going into round 2 of the league which is scheduled to take place next month and could feature competition against any of the other remaining 12 teams in the league. Well done to all swimmers who competed and also, thanks to Neal's Travel for getting the team there in style on the coach! The Round 2 team selection will be put together this week. 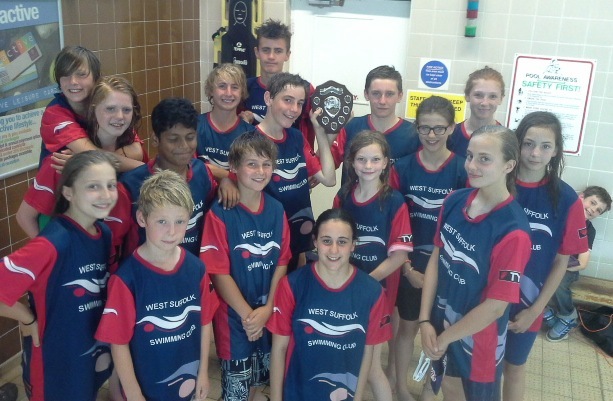 West Suffolk Swimming Club (WSSC) continued to step up and compete against the best teams in the Premier Division of the East Midlands National Arena League competition this past Saturday. After a strong showing in the 2013/14 league which saw the team get promoted from Division 1 to the Premier Division, the team continued to perform with tough competition from UEA City of Norwich, City of Cambridge, Modernians (Bedford), Biggleswade and St Ives all competing at Parkside Pools in Cambridge. It was a great team performance, with some outstanding swims on the night that saw WSSC tally up 11 victories, 15 2nd placed finishes and 15 3rd placed finishes out of 50 events. There were three individual wins on the night for senior swimmer Danny Proffitt (20) who won his events convincingly, dominating the mens 200m Individual Medley and both the mens 100m butterfly and freestyle events. Winning swims also came from: the boys 9-11yrs 4x50 freestyle relays (Ciaran Riches, William Tozer, Connor Gillingham and Sam Bullingham); girls 15 & under 4x50 freestyle relay (Beth Mottram, Emily Wood, Lana Mo and Jordanne Sillitoe); Beth Mottram (15 & under 100m butterfly); Sam Bullingham (10/11yrs 50m breastroke); Ciaran Riches (10/11yrs 50m freestyle); Molly Ollington (Open 100m freestyle – beating Jessica-Jane Applegate in the process who was a gold medal winner at the London 2012 Paralympic Games); the boys 9-11yrs medley relay (Connor Gillingham, Sam Bullingham, William Tozer and Ciaran Riches) and the girls open 6x50m freestyle relay (Molly Ollington, Emma Lees, Beth Wiseman, Lana Mo, Emily Wood and Beth Mottram). Second placed swims came from: the girls 9-11yrs 4x50 freestyle relay (Ella Hale, Lily Genner, Lauren Turner and Caitlin McKay); the girls open medley relay (Beth Wiseman, Lana Mo, Molly Ollington, Emma Lees); Lily Genner (10/11yrs 50m backstroke); Emily Wood (15 & under 100m backstroke); Ella Hale (10/11yrs 50m butterfly); Ciaran Riches (10/11yrs 50m Butterfly); Niamh Perry (13 & under 100m butterfly); Emily Wood (open 100m breastroke); Edward Briars (open 100m breastroke); Ella Hale (10/11yrs 50m freestyle); Esther Little (13 & under 100m freestyle); Fergus Schofield (13 & under 100m freestyle); the girls 9-11yrs 4x50 medley relay (Ella Hale, Caitlin McKay, Lily Genner, Lauren Turner); the girls 13 & under freestyle relay (Esther Little, Holly Sampher, Chloe-Jeane Parsley, Niamh Perry) and the girls 15 & under medley relay (Jordanne Sillitoe, Lana Mo, Emily Wood, Beth Mottram). Third placed swims came from: the girls 13 & under medley relay (Esther Little, Chloe-Jeane Parsley, Niamh Perry, Holly Sampher); boys 13 & under medley relay (Sam Wortley, William Harpur-Davies, Taylor Bowen, Fergus Schofield); boys 15 & under freestyle relay (Ben Wilkinson, Angus Robins, Myles Turner, Greg Buckle); William Tozer (10/11yrs 50m backstroke); Myles Turner (15 & under 100m backstroke); Molly Ollington (open 100m butterfly); Esther Little (13 & under 100m backstroke); Taylor Bowen (13 & under 100m backstroke); Angus Robins (15 & under 100m butterfly); Caitlin McKay (10/11yrs 50m breastroke); Charlie Whyte (13 & under 100m butterfly); Ben Wilkinson (15 & under 100m freestyle); Beth Mottram (15 & under 100m breastroke); the boys 13 & under 4x50 freestyle relay (Fergus Schofield, Sam Wortley, William Harpur-Davies, Charlie Whyte) and the boys 15 & under medley relay (Myles Turner, Greg Buckle, Angus Robins, Ben Wilkinson). The third round team will be announced before the end of the week. With two second places in the previous 2 rounds, we will be in with a chance of competing in the ‘A’ final for the third and final round in December (13th). This could be long course at either UEA, Norwich or Corby (TBC). West Suffolk SC were invited by Mildenhall SC to compete in the annual Larking on the Lark trophy gala recently. A team of 16 of our swimmers, several of whom had never competed for the club before, acquitted themselves well winning the trophy for the second consecutive year. This was certainly a great team performance with swimmers winning 35 out of the 43 events. It was also a pleasure to see that so many youngsters are now transferring the underwater and breakout skills that are emphasised so strongly in training to a racing environment. Well done to all swimmers that took part. A small team of West Suffolk swimmers travelled to Woodbridge for the first round of the 2014/15 season of the Winter League. Despite a few of the top swimmers not being available due to injury or illness and this 1st round gala being made up of the top 5 teams from last year’s competition,West Suffolk ran out comfortable winners. There were thirty 200m events of which West Suffolk swimmers were victorious in 14 events and they came 2nd in another 11 events.It was a good all round team effort,especially from the swimmers who stepped up to the mark at the last moment. Within these swims,some of the swimmers achieved new PBs and County Qualifying Times.Notable swims came from Ollie Pyle,Olivia Nicolai and William Harpur-Davies – all in 200 BRS races,Alex Proffitt in the 200 BF and William Tozer in the 200 BC. Well done to all swimmers that competed!